Which lesson learned would you like to pass on to Rotaractors? Keep enjoying your involvement – you should keep having fun! Only if you enjoy what you’re doing, you’ll be able to achieve what you set as goals for yourselves. Be open to new and different ideas, stay open in respect to doing things in different ways. You need to set an example: Leaders need to be the first ones to do things. What have you set an example in? their way to the Council on Legislation. 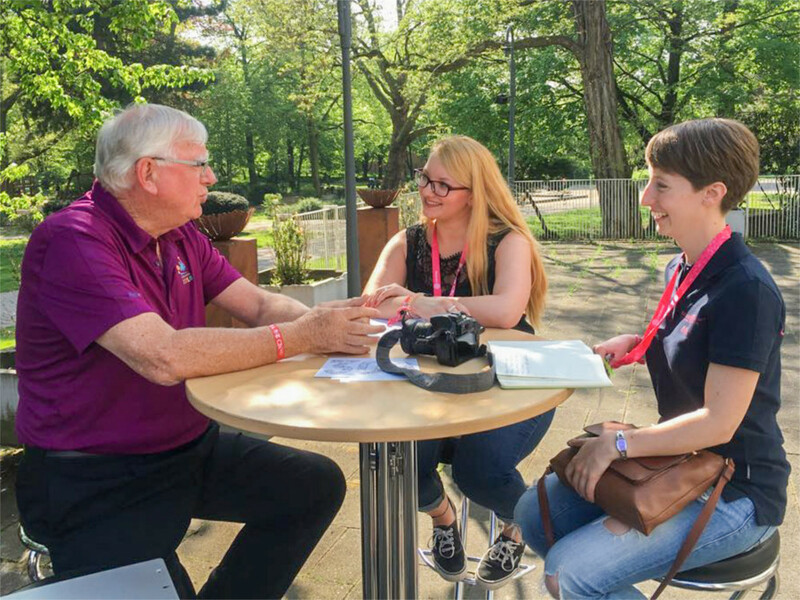 Speaking about conferences – What’s something you’ll take from this conference of German Rotaractors? You know, I was actually surprised, because Rotaract is pretty strong here in Germany. Usually, clubs form near universities or colleges, sometimes they’re community-based. Your conference wowed me with your industrious, energetic and impressive dedication! That’s really great work that everyone’s doing here and really exceptional! Where do you personally see potentials for improvement within the Rotarian family? Although there has been improvement already, I still think we need more women as members and in leadership positions. Sending women representatives to conferences may be one way of addressing this issue and creating awareness. Where does your strong interest in this topic come from? Well, it’s easy actually: I am and always have been a strong believer in equality. We firstly need to talk about these kind of inequalities and then we need to change them: It’s simply senseless for any Rotary Club to turn their back on half the population. After all, being fair to others is part of our reputation. Up until now: What are you most proud of within your year? I am a committed long-term environmentalist, so I think the answer would be: I’m proudest of the response to the idea of planting trees. Actually, I’m thrilled by the reaction from the Rotary world. It’s just a small gesture, but I hope that the results of planting those trees remind Rotary of their responsibility to both the people but also the planet. And what was the toughest part of being the Rotary International President? There are Rotary Clubs in some parts of the world that have to deal with manipulation and electoral fraud within their own rows. Luckily, it doesn’t happen often, but it’s enough to disappoint. I already had to remove one District Governor. Is there something you’d like the Rotaractors to know? at it! But the one thing I would ask of them is: When they must leave Rotaract, I hope they’ve enjoyed themselves and made fulfilling memories and I hope they seek to join Rotary to continue their involvement. And if the Rotary Clubs don’t express enough interest in you, just start your own Rotary Club. We indeed need younger members; we’ll be Making a Difference. Ton? Läuft. Kamera? Läuft. And Action! Bundessozialaktion: Beealive.